Carrot Cake has always been one of my favorites, but only when it’s made my way. That’s why I call this cake, Caryn Cake. There’s a secret ingredient that as of today, is no longer a secret! It’s Mace. Mace is a spice made from the outer covering that surrounds nutmeg seeds. The flavor is similar to that of nutmeg, but with its own subtle peppery flavor that gives this Carrot Cake it’s “je ne sais quoi”. I just know you will love it. 1. Preheat oven to 350oF. Grease two 8 inch round cake pans, or cupcake tins for 2 dozen cupcakes. You can use any size pans you like. The size and shape will determine how long it needs to cook. See step 11 below. 2. Cream sugar with margarine in a medium size bowl. 3. Slowly beat in flax seed mixture, agave, vinegar and vanilla. 5. Combine flours, almonds, baking powder, baking soda, xanthan gum, cinnamon and mace in a large bowl. 7. Stir in hot water, 1/2 cup at a time. Mix well. Batter should be thick. 11. Bake for about 40 min or until toothpick inserted in the center comes out clean. Turn off oven; leave cake in oven for 10 min to gradually cool (prevents cake form falling). Mini cupcakes will take about a half hour, average cupcakes take about 35-40 minutes. One large round will take about 60 minutes. If you make one large cake, cover the top with foil after 30 minutes to prevent top from burning. 12. Remove cake from oven and allow to completely cool. Remove from pan and top with frosting. Blend vegan cream cheese, almond or vanilla extract and sugar with a fork. Don’t use an electric beater, it can make it runny. Beat with fork until smooth, do not overbeat. Let chill several hours. 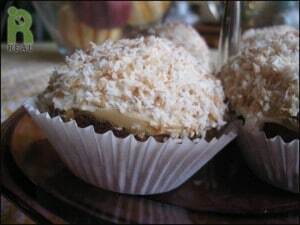 The frosting can be topped with plain coconut or toasted. To toast the coconut spread it out on a sheet pan and toast at 300oF for several minutes. Keep and eye on the sheet – it can brown quickly and burn. Shake the sheet ever one of two minutes so the coconut gets evenly toasted. When lightly browned, remove coconut from over and let cool. To Assemble Cake: Frost top of one layer, place the other layer on top and cover with frosting. Add coconut to top and sides by gently tossing it onto the frosting. Coconut that does not stick can be pressed into the frosting with a knife.